NEWARK, N.J. — The major storylines in the Coyotes’ 3-2 shootout win over the Devils on Thursday at Prudential Center were obvious. Goalie Thomas Greiss won his second straight game in relief of injured starter Mike Smith by stoning all three New Jersey shooters in the shootout. 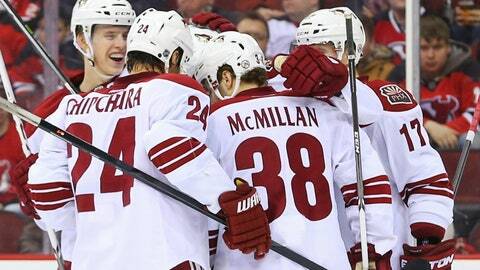 Mikkel Boedker netted his second-straight game-winning goal — this time in the shootout. And with five of a possible six points on this now concluded three-game trip, the Coyotes washed away the bitter taste of a late collapse Monday at Madison Square Garden (if not the lingering concern over Smith) and built a five-point lead over the idle Stars for eighth place in the Western Conference. But the subplot here was all about coach Dave Tippett, his staff and their willingness to keep veterans Derek Morris and Mike Ribeiro on the bench for a second straight game with two crucial points hanging in the thick Jersey air. It’s true that neither player was effective in New York, and it’s true that Morris has struggled for a while to be the steadying complement to Keith Yandle’s offensive forays, but Ribeiro could have helped the power play and could have added offensive insurance in a nail-biter in which Phoenix blew another two-goal lead, and he came to Phoenix in large part due to Tippett’s recommendation. It doesn’t reflect well when your $22 million center is wearing a tie when the puck drops, even if Ribeiro’s fashion sense is a tad more interesting than that of the average healthy scratch. But that’s Tippett in a nutshell. "They’re always difficult decisions to make," Tippett said of the healthy scratches. "But every decision you make, you make because you think they’re going to help you win. We just felt like our group competed so hard in Pittsburgh that we wanted to put the same kind of lineup back in." Phoenix took a 1-0 lead just 2:21 into the first period when Kyle Chipchura notched his third point of the road trip on a wraparound goal through Martin Brodeur’s pads after some heavy pressure created by newly returned linemate Lauri Kopikoski. Defenseman Chris Summers widened the lead to 2-0 late in the second period on a shot from the point thanks in large part to forward Brandon McMillan’s textbook screen. But Boedker’s speed created the only goal of the shootout, and Greiss stuffed Patrik Elias on New Jersey’s final attempt to clinch a win that pulled Phoenix within a point of the seventh-place Wild with Minnesota coming to Glendale on Saturday. "We know it’s going to be a battle the last nine, 10 games, but this is fun, this is why you play," captain Shane Doan said. "You wish you were in a better position where maybe you could cruise in, but we’re not. We’re in the position we’re in, and we’re going to find ways to win." The Coyotes expect to know more about the extent of Smith’s injury and the timeline for his return on Friday after he meets with doctors. That storyline could dominate the news before Saturday’s game, but the tough decisions of a coaching staff and the return of the team’s old identity defined this road trip.